Hemp Force Vanill-Açaí is a plant protein made from hemp, açaí berry, mesquite powder, chia seeds, and flax seeds, and naturally flavored with stevia and vanilla bean. This hemp protein blend contains a unique mixture of two proteins, edestin and albumin, present in a 3-to-1 ratio. Edestin contains a higher content of essential amino acids compared to soy protein and is only found in hemp. Albumin helps boost the body’s ability to synthesize human blood albumin. Delicious in smoothies, coffee, tea, and more. Also a great addition to your morning oatmeal and baking. Made with earth grown ingredients, Hemp Force Vanill-Açaí packs a seriously nutrient dense punch, making it the perfect guilt-free addition to your favorite foods and drinks. Apart from being a great source of protein, it’s also rich in fiber, making it great for digestion and weight management by keeping you feeling full longer. Vegan | Non-GMO | Soy Free | Dairy Free | Gluten Free. 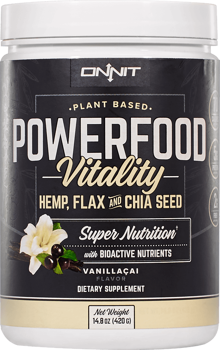 Hemp Force Vanill-Açaí is a vegetarian friendly, raw plant-based protein that checks every box on the health conscious human’s list. No artificial flavors, coloring, additives, preservatives, or sweeteners here. Great post workout recovery supplement. Each serving contains 15g of high-quality hemp protein, 7g of fiber, and other nutrient dense ingredients such as Omega 3’s and essential amino acids. Contains no psychoactive cannabinoids. All Onnit products are designed with respect to published banned substances list and drug tests.